The Province of Treviso (Italian: Provincia di Treviso) is a province in the Veneto region of Italy. Its capital is the city of Treviso. The province of Treviso has an area of 2,479.83 km2 (957.47 sq mi) and is formed mainly by plains but there are hills in the northern part. In the border with the Belluno province, there are some mountains over 1,000 m (3,300 ft) high, found mainly in the Dolomites, part of the eastern Alps; the highest mountain of the province is Monte Grappa 45°52′24″N 11°47′57″E﻿ / ﻿45.87333°N 11.79917°E﻿ / 45.87333; 11.79917﻿ (Monte Grappa)) that is 3,342 m (10,965 ft) high and is on the border with the Belluno and Vicenza provinces.. The province is rich in water; the main river is the Piave river that flows through the province from north to south. 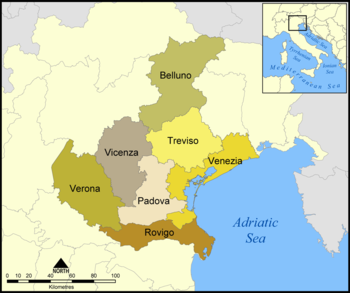 The province of Treviso borders to the north with the Belluno province, to the east with the Friuli Venezia Giulia region (Pordenone province), to the south with the Padua province and the Metropolitan City of Venice, and to the west with the Vicenza province. As of 1 January 2016[update], there are 885,447 persons living in the province, for a population density of 357.1 inhabitants/km². Piazza dei Signori and Palazzo dei Trecento, Treviso. ↑ "Governo" (in Italian). Provincia di Treviso. Retrieved 11 April 2017. ↑ "Provincia di Treviso" (in Italian). Tuttitalia.it. Retrieved 11 April 2017. ↑ 3.0 3.1 3.2 "Statistiche demografiche ISTAT" (in Italian). Demo.istat.it. Retrieved 11 April 2017. ↑ "Monte Grappa, Italy". Peakbagger.com. Retrieved 11 April 2017. ↑ "Comuni in provincia di Treviso per popolazione" (in Italian). Tuttitalia.it. Retrieved 11 April 2017. Wikimedia Commons has media related to Province of Treviso. This page was last changed on 12 January 2018, at 12:00.